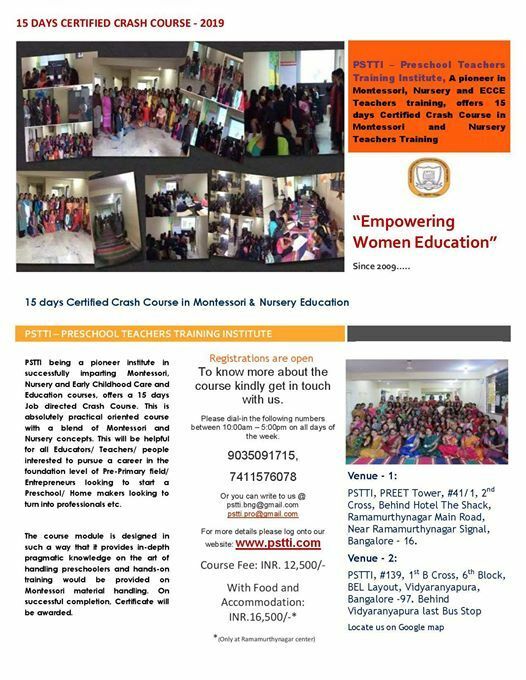 PSTTI being a pioneer institute in successfully imparting Montessori, Nursery and Early Childhood Care and Education courses, offers a 15 days Job directed Crash Course. This is absolutely practical oriented course with a blend of Montessori and Nursery concepts. This will be helpful for all Educators/ Teachers/ people interested to pursue a career in the foundation level of Pre-Primary field/ Entrepreneurs looking to start a Preschool/ Home makers looking to turn into professionals etc. The course module is designed in such a way that it provides in-depth pragmatic knowledge on the art of handling preschoolers and hands-on training would be provided on Montessori material handling. On successful completion, Certificate will be awarded.